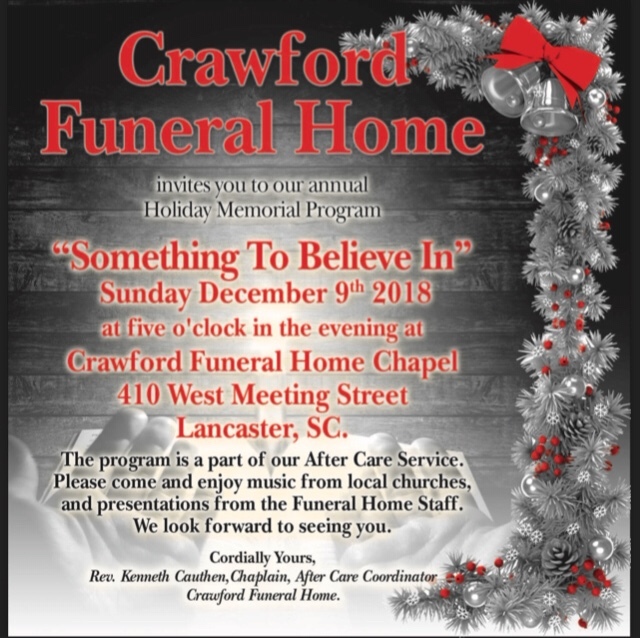 Crawford Funeral Home invites you to our annual Holiday Memorial Program "Something To Believe In" Sunday December 9th 2018 at five o'clock in the evening at Crawford Funeral Home Chapel 410 West Meeting Street Lancaster, SC. The program is a part of our After Care Service. Please come and enjoy music from local churches, and presentations from the Funeral Home Staff. We look forward to seeing you. Cordially Yours Rev. Kenneth Cauthen, Chaplain, After Care Coordinator Crawford Funeral Home.